These jars are a work in progress, like my rocks (update- 88 done so far!). I'm going to make several jars that will be used to hold flowers, sparklers, and pinwheels at the wedding reception. I think thin ribbons might look cute woven in between the stitches and tied into a little bow, but I'll have to do some experimenting. I'm not using any sort of formal pattern, so I'm learning as I go. The first four have turned out pretty well, and I'm sure I'll get a little better with each one I do. Make a basic flat round circle about the size of the bottom of the jar. Continue with the increase pattern until circle is same size as the bottom of the jar. When circle is desired size, increases are no longer needed, and you can crochet in rows however you like, making it up as you go, or adapting lace patterns to work. Once I finished the round circle for my first jar, I did one dc in each stitch all the way up. For the next couple I made it up as I went, to create a more "lacy" look, and for one I used a shell stitch from the book Crochet Inspiration by Sasha Kagan (awesome book by the way-lovely pictures). After the last row of double crochet at the top of the jar, I found that a row of single crochet made the crochet cover nice and snug just at that little bit of jar that gets narrower where the lid would screw on. This jar was a little more time consuming as I had to decrease stitches the farther up the jar I went. After a few rows I had to crochet the cover right onto the jar because it was harder to slip the jar into the cover when it started to get narrower. Anyways, I hope they are actually turning out as cute as I think they are. I've got lots of ideas to experiment with for the next ones! 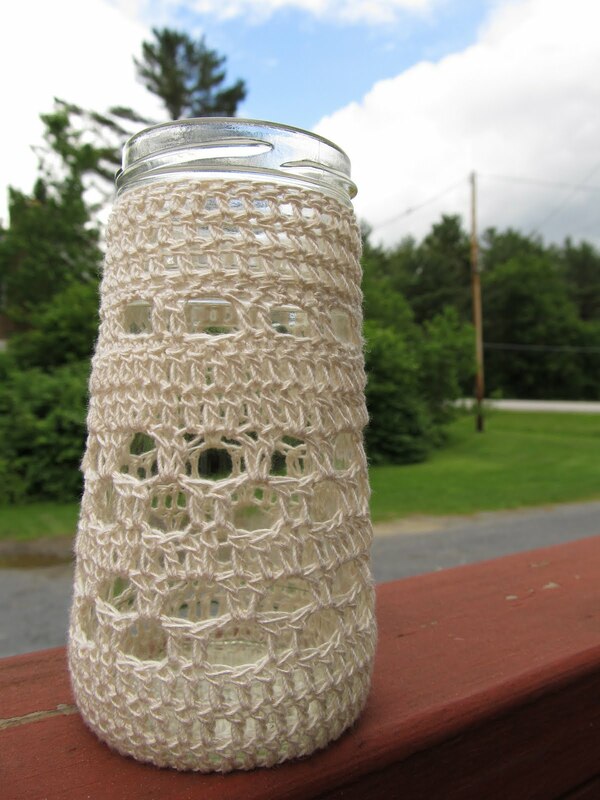 I made one today with a small jar that I will use with a tealight candle. Thanks for the great idea! so very pretty! Great idea! Thank you so much for the info!